Russian-American nuclear physicist, cosmologist and writer who embraced the Big Bang Theory to explain the origin of the universe. Later in his career, he broadened his field of study into biochemistry, DNA and genetic theory. It was only in the previous year, 1963, that the first quasar (quasi-stellar object) had been identified. Maarten Schmidt, using the Hale optical telescope, had studied it as a faint star-like object with a visible jet. Its spectrum featured surprisingly unusual emission lines, which he identified as ordinary hydrogen lines shifted toward longer wavelengths (redshifted) by 16%. If that large shift is due to velocity, it is moving away at one-sixth the speed of light and one of the most distant objects visible. Schmidt came to this realization on 5 Feb 1963, and he published his interpretation of the surprising facts about the quasi-stellar object in the journal Nature on 16 Mar 1963. He did not use the word “quasar” in the article. That name was coined in print in a May 1964 issue of Physics Today by the Chinese-American astrophysicist, Hong-Yee Chiu, who introduced the use of the contraction for convenience. Quasars radiate as much energy per second as a hundred or more galaxies, which makes Gamow’s description as “brighter than a billion suns” quite accurate, as well as being “afar.” In fact, though, the study of quasars helped solve a puzzle, providing a final piece of evidence that undermined the Steady State theory of the universe, and supported the Big Bang theory. 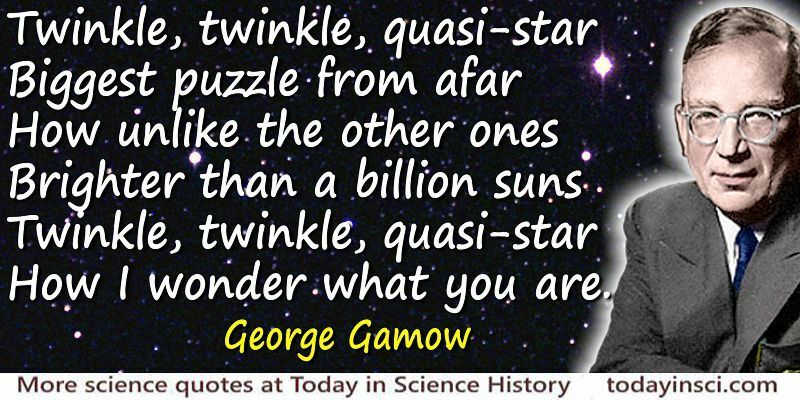 Science Quotes by George Gamow. 4 Mar - short biography, births, deaths and events on date of Gamow's birth. Mr Tompkins in Paperback, by George Gamow. - book suggestion.